One night a week or two ago, I was craving brownies. Nolan was still awake, but I thought I could pull it off pretty quickly anyway while he was hanging out with his daddy. I opted for the semi-sweet variation of my favorite brownie recipe, which I’d never tried out before. (Usually I go for the bittersweet version, but we have a ton of semi-sweet chips.) As soon as I measured out the chocolate, however, Nolan started fussing, and I ended up holding him and dictating the recipe to Jeremy. The batter turned out more like cookie dough, so much so that he had to pat it into the pan, but the recipe had warned that the cocoa butter content of the semi-sweet chips would create a stiff batter, so I brushed aside my doubts. Twenty minutes went by, and I managed to get Nolan down for a nap just in time to pull the pan from the oven. I knew immediately that there was a problem, because the brownies looked heavy and dull. A touch confirmed that they were hard as rocks, and suddenly it struck me: the flailing baby had distracted me so much that I forgot to tell Jeremy to put two eggs in the batter. No wonder my brownies looked more like a huge square sablé cookie. Good thing we had that 10-lb bag of chocolate chips from Costco—I darted around the kitchen whipping up a second batch of brownies, this time double-checking myself at every addition. Into the oven they went, and I pondered what to do with the evidence of my failure. I could probably have tossed them out and Jeremy would never have been the wiser, but I couldn’t quite bring myself to throw out something that still tasted fine. I had just decided to break them up for ice-cream mix-ins when Nolan woke up again and off I went. A few days later, once gooey, delicious Brownie Batch #2 had been eaten up, I went back to Batch #1, crushed it up into cookie crumbs in a ziploc bag, and mixed it into freshly churned Philly-style vanilla ice cream. 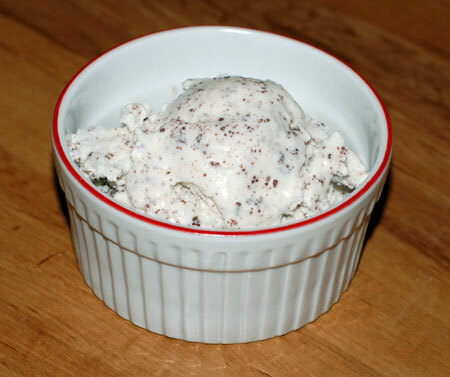 The result was like upscale cookies-n-cream ice cream, so fantastic that I will be sorely tempted to “forget” the eggs in future batches of brownies just for that purpose. The recipe is below, in case anyone else would like to make the same mistake. Preheat the oven to 350F, and line a 9×9 pan with foil or parchment, extending up past the edges of the pan on two opposite sides for easy removal after cooking. In a microwave-safe bowl, combine the chocolate chips, butter and sugar. Microwave just until chips and butter are melted (for mine, I did 60 seconds at 80% power, stirred, then back in for 30 seconds at 60% power); stir with a wooden spoon to combine, then add the vanilla and salt. * The batter will be thick like cookie dough. Press into the prepared pan and bake for 20 minutes, until the brownies are cooked through. Cool for 10 minutes, then remove from the pan using the parchment or foil edges and allow to cool to room temperature on a rack. Crumble into chunks and crumbs for stirring into vanilla ice cream, or eat shards like cookies. *If you want to make actual brownies with this recipe, beat in two cold eggs one at a time at this point. The batter will be thick, glossy and pourable. Bake for about 20 minutes, and remove when the top is shiny and crinkly, but the insides are still moist. I love it when mistakes turn into something so wonderful!